The Ricoh WG-4 GPS is toughened and waterproof camera to take on the likes of the Canon PowerShot D30, Nikon Coolpix AW120, Olympus Tough TG-3 and Panasonic Lumix FT5. It’s a direct replacement for last year’s WG-3 GPS from Pentax, now rebranded by parent company Ricoh. The WG-4 GPS is a certainly tough cookie, being shockproof from heights up to 2.0 metres, freezeproof down to -10 degrees, waterproof to a depth of 14m and able to withstand up to 100kg of crushing force. Inside is a back-illuminated 16.0 megapixel CMOS sensor capable of a sensitivity range of ISO125-6400 and you get Full HD video capture as well. This is mated to a 4x optical zoom lens sporting a focal length range of 25-100mm (in 35mm terms) and a maximum aperture of f/2.0. Sensor-shift Shake reduction is also employed to help tame the effects of camera shake. As its name suggests, the WG-4 GPS is also equipped with GPS location mapping to geolocate your images and can be had for £309.99/$329.95/€329.00. 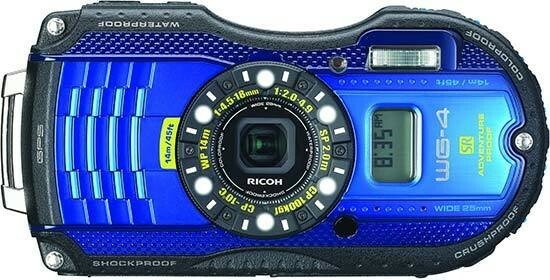 Alternatively the standard Ricoh WG-4 makes do without GPS, bringing the price down to around £279.99/$279.95/€279.00. The first thing that strikes you about the WG-4 is its toughness. Sure, it hasn’t got the deepest waterproof rating in the class and it’s not quite top dog in terms of shockproofing, but the WG-4 feels more substantial than many of its similarly-specced rivals and it easily shrugged off the abuse we inflicted on it. The Tonka toy styling leaves you in no doubt that this is designed for extreme environments, however such pumped-up looks don’t exactly make this a subtle snapper. Despite its added toughness, the WG-4 is no harder to use than a regular compact camera. Buttons are kept to a minimum in order to minimise possible water and dust entry points, with the top panel containing only the power button and shutter release. The zoom controls can be found on the rear in the form of two buttons, with playback and video record buttons directly beneath. There’s the usual four-way navigation dial too, which also controls the self timer, macro and flash, as well as accessing the WG-4’s various shooting modes. Lastly there’s a menu button, plus a green button alongside it to delete files in playback mode and also enlarge the display preview when shooting. Thanks to waterproof seals, the buttons themselves are a bit stiff and spongy to use, requiring more of a prod than most cameras. An obvious alternative would be to use a touch screen controls, however the WG-4’s 3.0” monitor isn’t touch-sensitive. That’s no bad thing though, as capacitive touch screens won’t work underwater or if you’re wearing normal gloves and hence aren’t a great idea for action-orientated cameras. What is irritating is the monitor’s widescreen format. This works well when recording widescreen HD video. However, when shooting stills at maximum resolution in the usual, squarer, 4:3 image format, you’re left with two black bars on either side of the image preview. Consequently what’s technically a 3.0” screen ends up displaying roughly a 2.5” image. Thankfully the screen’s colour reproduction and viewing angles are very good, though it could do with a little more brightness when shooting under sunlight and the 460k-dot resolution is only average. Underneath the WG-4 sits a double-locked door protecting the battery, SD card slot, data and charging ports from accidental exposure to water or dust. The tripod mount is located in a slightly odd position at the extreme end of the camera. This isn’t the most stable location, however it’s unlikely this action-orientated camera will be spending much time tied down. Move to the front of the camera and you’ll find a couple of nifty features. Six small LEDs encircle the lens, providing subtle illumination for extreme close-up subjects. Selecting the WG-4’s Digital Microscope mode activates them so subjects as close as 1cm won’t be cast in the camera’s shadow. The lights can also be used as a torch by pressing and holding the green button on the rear panel. Go for the GPS-equipped WG-4 and you’ll also get a front-mounted LCD screen. It’s not here to help you snap selfies, but it will display the time, even when the camera is turned off. The screen can also be configured to show your height above or depth below sea level, as well as the surrounding air pressure. Using the GPS function in the WG-4 GPS is a doddle and enables location data to be stored alongside each recorded image so you can map your subjects on a program like Google Earth. The system works well but can struggle to find a satellite signal in built-up areas and is rather power hungry, continuing to work even when the camera is turned off. Considering the rather average 240-shot CIPA rated battery life, you’d be wise to use the GPS function sparingly. The camera’s internally-focussed lens protects it against water and shock, but it also means you don’t have to wait for the lens to extend on start-up. Consequently the WG4 is ready to roll in around 1.5 seconds and the autofocus system wastes no time in findings its mark, locking on to your subject almost instantly in good light. Darker conditions can cause things to slow a bit, but rarely does the camera take more than a couple of seconds to focus. Now, keen followers of the Pentax/Ricoh camera line-up may have noticed that the WG-4 bears more than a passing resemblance to the old WG-3 GPS. In fact externally they’re identical, and not a lot has changed under the skin either. The only new addition to the WG-4 is a shutter priority mode to help you blur moving subjects like waterfalls, or create car light trails at night. A new range of optional mounting accessories has also been introduced alongside the WG-4 though. Choose from an adhesive mount to stick the camera to flat objects, a clamp for attaching to handlebars or a suction cup system that’s perfect for mounting the WG-4 to a canoe or kayak. These accessories are great for making the most of the WG-4’s Full HD video capture and can also be used with other WG-series cameras. Other accessories worth noting are the lens adaptor ring that enables an optional DW-5 wide-angle lens to be fitted, plus the included carabiner clip strap for attaching the WG-4 to a bag or belt. This does a great job for its intended use, though it’s not much use as a conventional wrist strap. The WG-4 may not have gained much over the WG-3, but it has lost a feature; namely wireless Qi charging. This allowed the WG-3 to charge from an inductive charging mat and consequently reduced the number of times you’d need to open the battery/charging port door and risk water or dust intrusion. Granted, no Qi charging mat was included with the WG-3, hence the WG-4 only loses the potential to charge wirelessly, but it’s a pity that the new model is a step back in this respect. On the subject of omissions, the WG-4 still has to make do without a panorama capture mode and the dozen Digital Filter effects you do get are edit-only processing features which can’t be applied whilst shooting. Lastly the WG-3’s menu system remains unchanged for the WG-4. It is fairly clear and easy to navigate, but low resolution icons and fonts make it look distinctly dated compared to the competition. It’s not short on gadgets though and the useful twin-axis level on the shooting overlay makes it a breeze to compose level shots.